This week, Jimmy Fallon headed to warm and sunny Los Angeles for a full week of The Tonight Show tapings. Fallon’s first big Los Angeles episode aired last night, and what better way to kick off the West Coast shenanigans than to recreate the opening sequence from The Fresh Prince of Bel-Air? Check out Fallon’s Tonight Show version, below. “The Fresh Host Of Tonight” totally reimagines the lyrics to Will Smith’s popular 90s sitcom to explain how it has been damned cold in New York City and Fallon’s house band, The Roots, enquired if they could possibly take the show on the road. 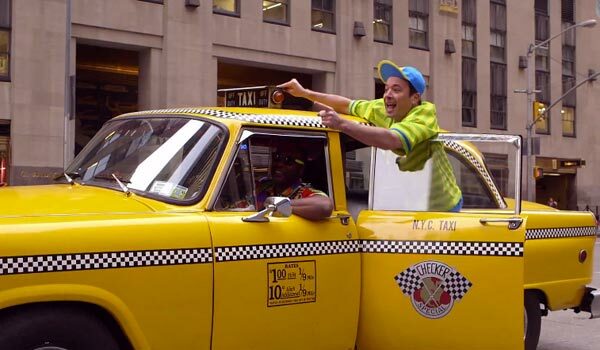 Los Angeles is an obvious choice, as the weather is pretty nice in the West Coast city, even in the winter, so Fallon hops into a cab that is surreally being run by DJ Jazzy Jeff and makes his way to Universal Studios in LA. 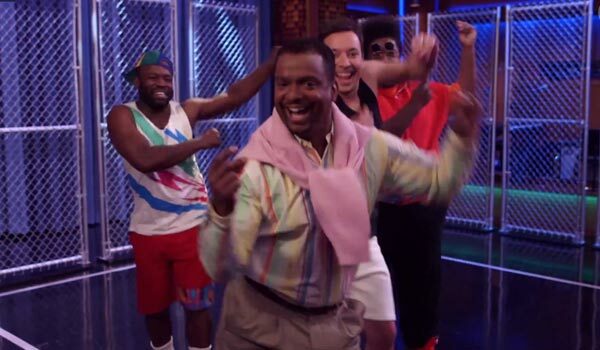 Oh yeah, and there is a great Fresh Prince cameo when Alfonso Ribeiro shows up, dressed as Carlton Banks and ready to get his groove on. The intro leads into Fallon’s actual show, which last night featured Birdman actor Michael Keaton and Gwen Stefani. Tonight, Ellen DeGeneres and Neil Young are scheduled to pop up on the show. Wednesday is the big day for guests, featuring Vin Diesel, Carl Reiner, Kobe Bryant, Iggy Azalea and Jennifer Hudson. Later this week, Will Smith, Rosamund Pike, Jack White, Jennifer Lopez, Anthony Mackie, Jamie Dornan and more are expected to appear. Jimmy Fallon is taking over the studio that Conan occupied when he briefly ran NBC’s The Tonight Show before getting kicked off the network in 2010. His tenure in Los Angeles is also fitting, as The Tonight Show taped in Los Angeles before moving to New York for Fallon’s run. It should be a nice way to shake things up on the series, but also to give the team a chance to get away from the cold, as noted prior. And as long as the team keeps putting together fun sketches like The Fresh Prince of Bel-Air bit, it should be a particularly good week for The Tonight Show Starring Jimmy Fallon. New episodes of The Tonight Show air weeknights at 11:35 on NBC. And in case you need a little throwback music in your life, we've included the original The Fresh Prince of Bel-Air intro, below.